Over the last four weeks, everywhere we go people stop us and ask about our mission trip to Russia. Some have read the blog, some have seen the pictures - but everyone seems genuinely interested in hearing the stories and tales of our journey to Russia. We are more than willing to oblige. :-) The stories never get old to us, the pictures are still fresh in our minds and our hearts are still filled with great joy and love for the children in Slobodskoy. We are excited to announce a community-wide event to share more about our trip to Russia - more stories, more pictures and more opportunities for you to get involved. You do not need to be a sponsor of a child or a member of Christ United Methodist Church. All you need is a heart for children and a desire to learn more about what's happening in Russia. Lunch will be served. 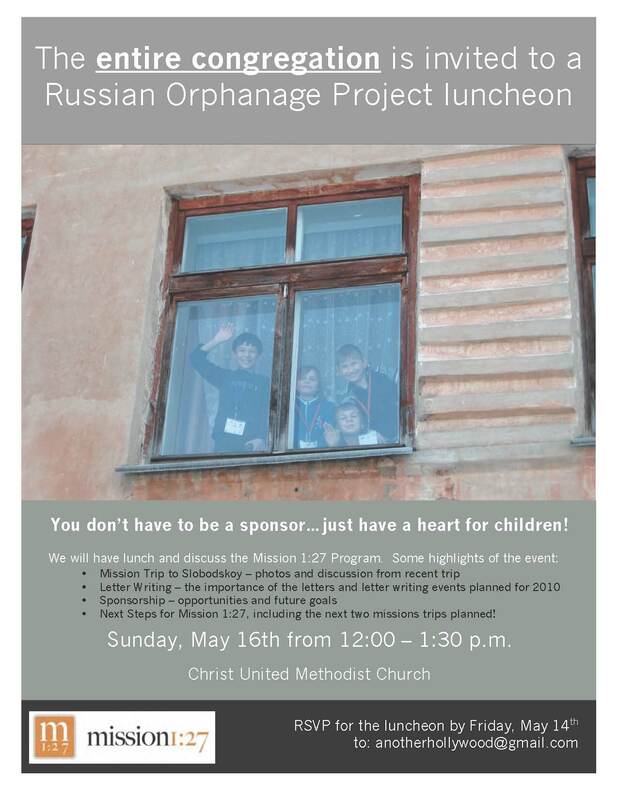 The event is in two weeks on Sunday, May 16 from 12:00 - 1:30 p.m. You will get the chance to hear from many of those who traveled to Russia and learn more about what happened there and what's next. We hope to see you there. The complete invitation is below with RSVP instructions. You can also click on the LINK HERE to see the Facebook event and RSVP page.